Not only is the SRT-1000 Yamaha’s first soundbase, but it’s also the first to promise ‘true’ surround sound, using technology found on the company’s high-end digital sound projectors. The cabinet houses eight 2.8cm drivers that, in simple terms, produce beams of sound that cannon off the walls and into your ears. These handle the surround channels, while the other drivers and dual subwoofers handle front, centre and LFE, resulting in a proper 5.1-channel experience – in theory, at least. You don’t need to see the badge to know this is a Yamaha product. The black finish, sleek lines and brushed top panel have the company’s fingerprints all over them – literally, in the case of the gloss-black fascia. Build quality is excellent, with a brick-like bodywork giving you absolute confidence to plonk your weighty screen on top (as long as it’s lighter than 40kg). At 77mm high it’s not the slimmest soundbase you’ll ever see, but it looks discreet enough. Disappointingly, a row of lights is used in place of a full LED display, which makes operation more cryptic that it could be, particularly when trying to tweak the sound. They light up in various patterns for different settings, like some sort of hi-tech semaphore. The lack of HDMI sockets means the SRT-1000 can’t be used as a hub for all your hi-def home cinema gear, which is disappointing at this price. However, the provision of one coaxial and two optical digital inputs lets you connect hardware directly and take advantage of built-in Dolby Digital and DTS decoding. The line-up is completed by an analogue input and subwoofer output. Surround sound technology is the SRT-1000’s key feature. The beam drivers can be configured for your room layout using three preset buttons on the remote, which adjust its performance according to the unit’s proximity to the walls. Yamaha’s HT Controller smartphone app gives you even more flexibility, allowing you to enter the position and room size by swiping your finger around the onscreen graphic. But there's no mic-assisted setup. Other features are built-in aptX Bluetooth and a range of Cinema DSP surround modes, including Movie, Music, Sports, Game and TV Program, and Clear Voice. The supplied remote is fine thanks to its thoughtful button layout, but the SRT-1000 works best with the HT Controller app at the helm. The Yamaha offers an unusual amount of control over its performance. Built-in test tones let you tweak each channel, and there’s a dedicated subwoofer volume on the remote. Impressive is the word here. With a Blu-ray deck piping a DTS track into the optical input, Pacific Rim’s riotous melees are handled with a level of authority and immersion missing from many competing models. 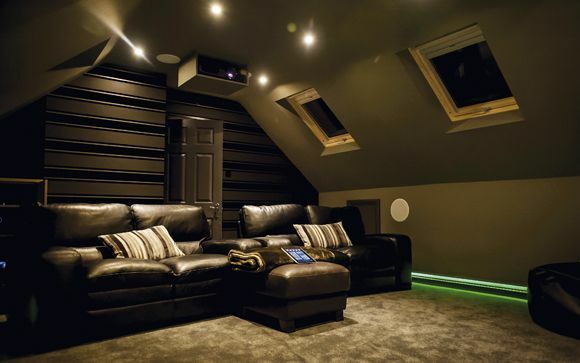 The beam tech gets as close as possible to a 5.1 speaker system, firing effects deep into the room. Missiles, gunshots and falling debris pop and fizz with terrific width, making it feel like a bubble of sound. Naturally, it can never match the accuracy of a genuine 5.1 setup, but just getting this close is a real achievement. That said, the technology is fussy. It took lots of trial and error, and even experimenting in different rooms, to hear the system working properly. Yamaha even lays out a long list of reasons why it might not work in the manual. If your room’s too wide or there are obstacles in the way, you'll come unstuck. But even if it doesn’t work, all is not lost. The Yamaha’s huge, punchy bass output, attacking tone and clear detail make you feel involved in the action anyway. Bass notes are deep and well-controlled (provided you exercise restraint with the subwoofer controls), with a convincing scale. A word of caution though – avoid the Music preset, which compresses the sound and adds a distracting echo. Yamaha has lifted some of the tech that makes its YSP models so effective and put it to good use here, in a nicely-styled enclosure with excellent app control. Performance is very accomplished – just don't expect a 5.1 miracle.